MIAMI, Fla., March 13, 2012—Patrick J. O’Connor, a partner with Miami law firm Harper Meyer Perez Hagen O'Connor Albert & Dribin LLP, published his debut literary novel, The Last Will and Testament of Lemuel Higgins, on Feb. 1, 2012. After a book publicity tour through his native Western New York, O’Connor is planning several signings in Miami. The first will be 6-8 p.m., Thursday, March 15, at Harper Meyer’s 10th Anniversary Fundraiser in the lobby of the Miami Center. The fundraiser, which includes a silent auction, will benefit the South Florida Fragile X Clinic, University of Miami Miller School of Medicine. O’Connor’s novel is a fictional account of personal ruin and redemption set in the hardscrabble farmlands and towns of rural upstate New York. It’s told in the voice of a local farmhand who achieves his dream of playing Major League Baseball, before the death of his estranged father sends him into a downward spiral that costs him everything. 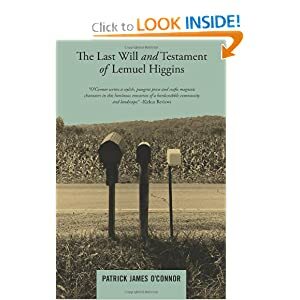 Using the unusual and innovative format of a last will and testament, the book's central character, Lemuel Higgins, makes a direct, first-person appeal for forgiveness and a desperate, last bid for atonement to the wife and child he has driven away. Patrick O’Connor was born and raised in farming country south of Buffalo, New York, where he worked variously as a horse trainer, farmhand, park ranger, waiter, septic tank cleaner, and social worker. In 1993, he worked as a congressional aide in the Washington, DC offices of New York Senator Daniel Patrick Moynihan. After studying English Literature at the University of Richmond, he spent a season hiking the Appalachian Trail before pursuing a degree in law. Then, while studying at Georgetown University Law Center, he joined a fact-finding expedition to Guatemala, where he spent several years climbing volcanoes with his dog, Jonah, and working on indigenous rights and environmental issues. At Harper Meyer, O’Connor is a trademarks and copyright attorney and an international business litigator. The Last Will and Testament of Lemuel Higgins, published by Miami’s Blackbriar Press, is available in hard cover, paperback, and ebook at amazon.com, bn.com, Barnes & Noble, and local bookstores.